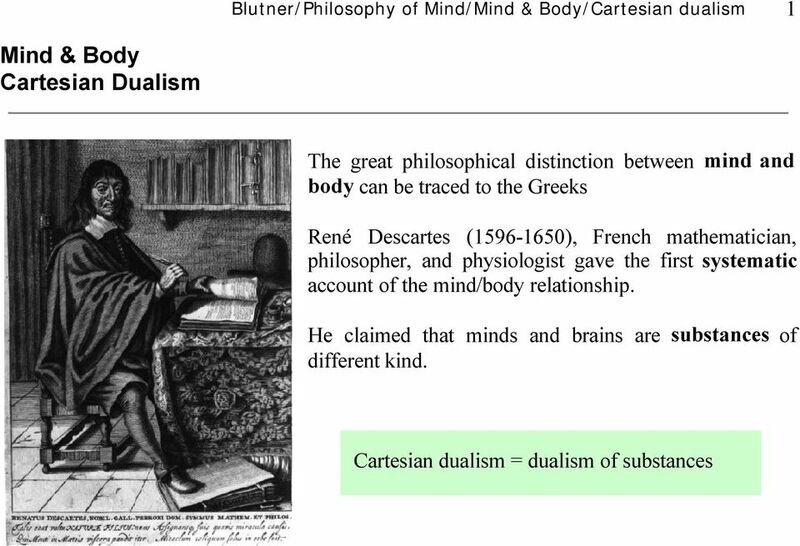 Download "Mind & Body Cartesian Dualism"
2 Blutner/Philosophy of Mind/Mind & Body/Cartesian dualism 2 What are substances in Descartes sense? 1. Individual things * that can exist independently (this excludes shadows) 2. Most substances are complex; they are composed of other substances. 3. Substances enter into relationships with other substances (being part, causality) 4. Substances have properties, but they are more than bundles of properties 5. 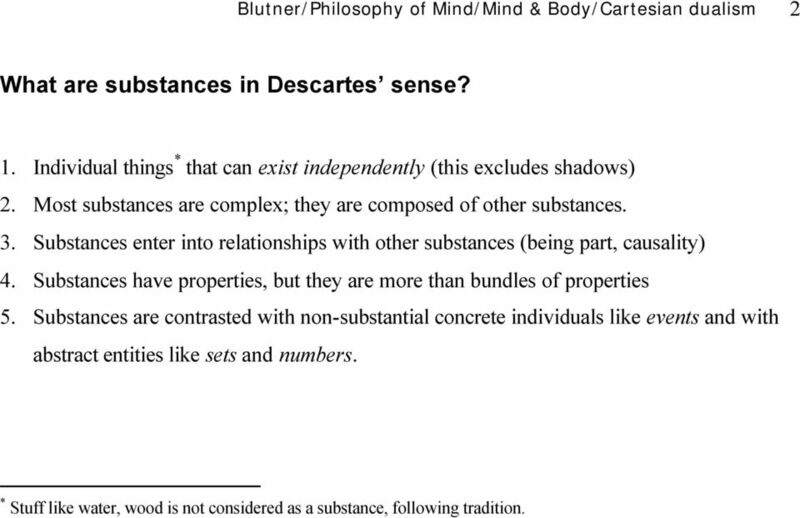 Substances are contrasted with non-substantial concrete individuals like events and with abstract entities like sets and numbers. * Stuff like water, wood is not considered as a substance, following tradition. 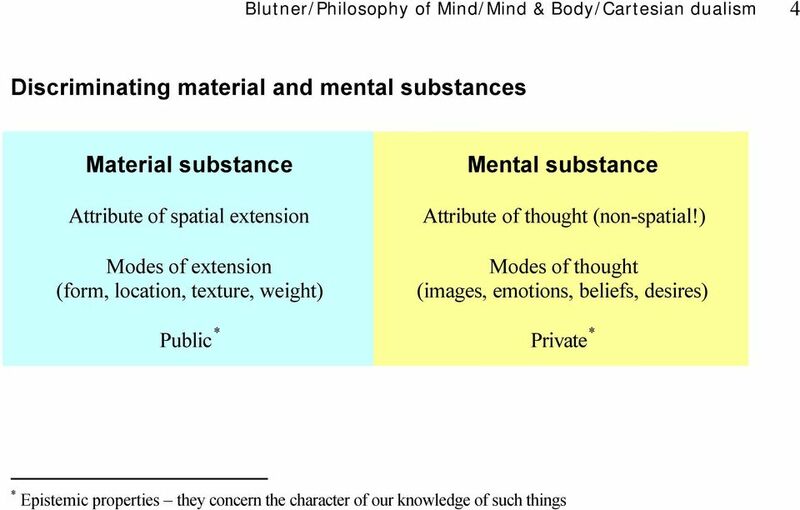 3 Blutner/Philosophy of Mind/Mind & Body/Cartesian dualism 3 Descartes attribute-mode distinction Instead of properties of substances Descartes speaks of attributes and modes. An attribute is what makes a substance the kind of substance it is A mode can be that can be seen as specifying the attributes possible values. These specifications relate to properties in the ordinary sense. Example: The attribute of a material substance is spatial extension. The particular shape and size possessed by material substances are modes, ways of being extended. 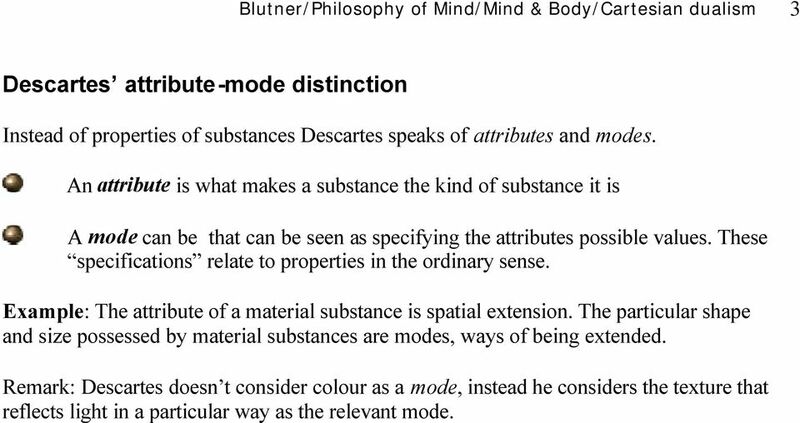 Remark: Descartes doesn t consider colour as a mode, instead he considers the texture that reflects light in a particular way as the relevant mode. 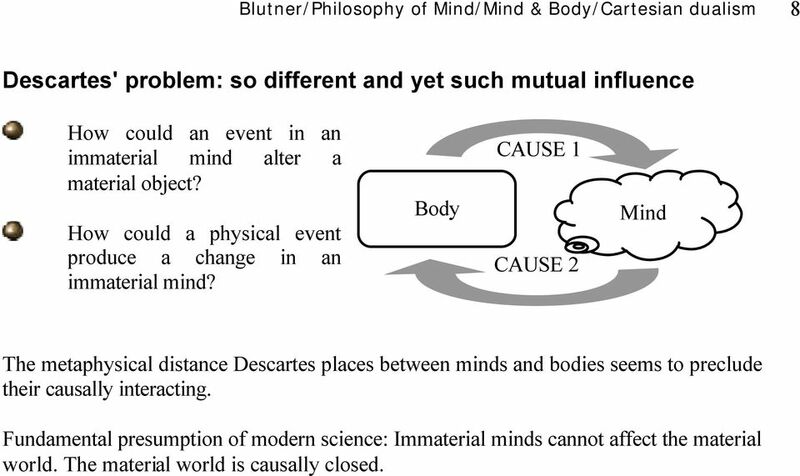 8 Blutner/Philosophy of Mind/Mind & Body/Cartesian dualism 8 Descartes' problem: so different and yet such mutual influence How could an event in an immaterial mind alter a material object? How could a physical event produce a change in an immaterial mind? Body CAUSE 1 CAUSE 2 Mind The metaphysical distance Descartes places between minds and bodies seems to preclude their causally interacting. Fundamental presumption of modern science: Immaterial minds cannot affect the material world. The material world is causally closed. 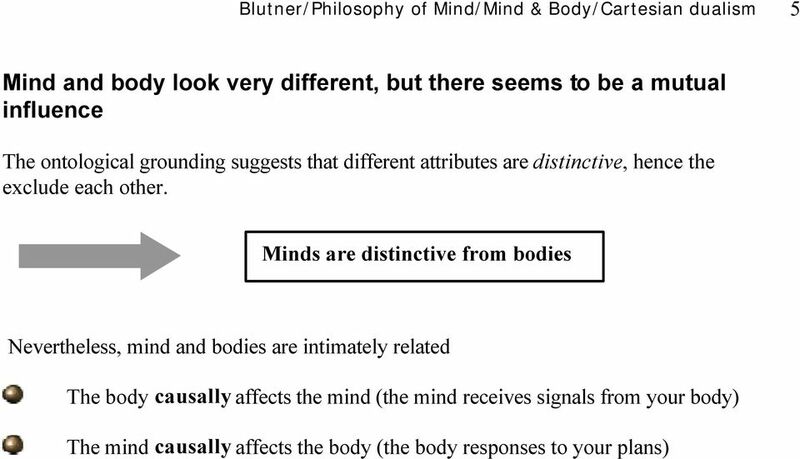 9 Blutner/Philosophy of Mind/Mind & Body/Cartesian dualism 9 Descartes causal interactionism Causal interaction between the mind and the body occurs in the pineal gland. Animal spirits, fluids made up of extremely fine particles flowing around the pineal gland, cause it to move in various ways, and these motions of the gland cause conscious states of the mind. 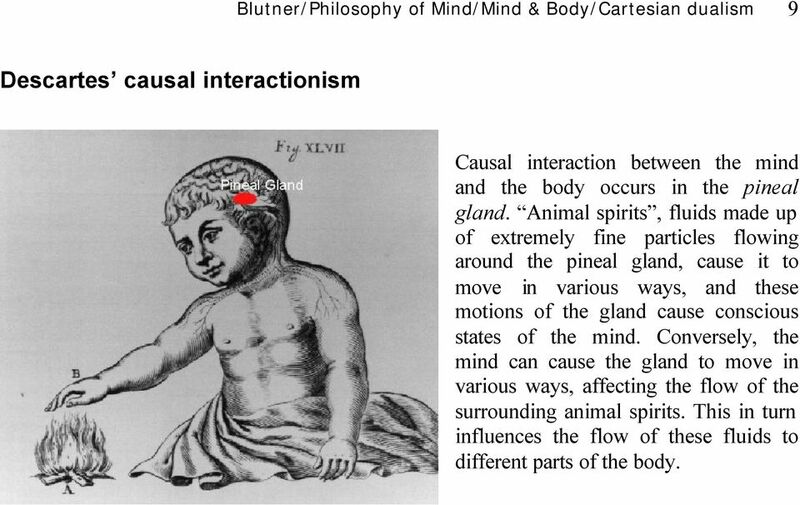 Conversely, the mind can cause the gland to move in various ways, affecting the flow of the surrounding animal spirits. This in turn influences the flow of these fluids to different parts of the body. 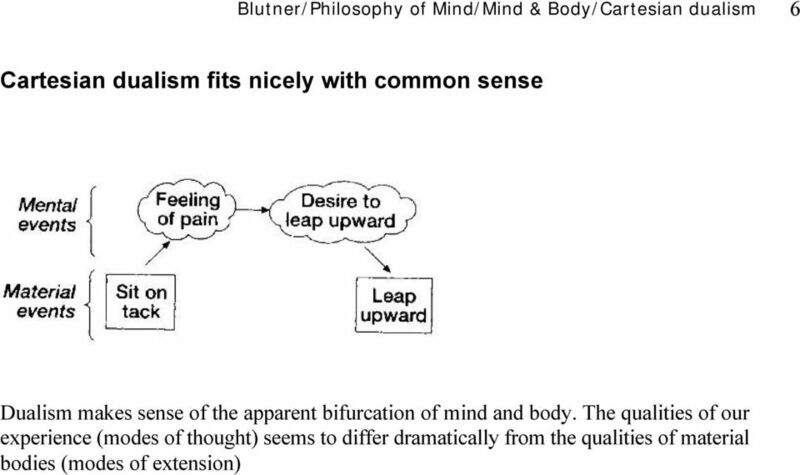 10 Blutner/Philosophy of Mind/Mind & Body/Cartesian dualism 10 The traditional mind-body problem 1. 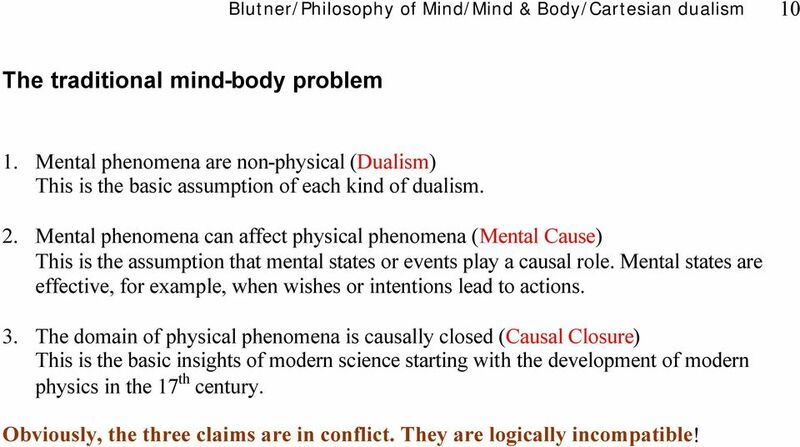 Mental phenomena are non-physical (Dualism) This is the basic assumption of each kind of dualism. 2. Mental phenomena can affect physical phenomena (Mental Cause) This is the assumption that mental states or events play a causal role. Mental states are effective, for example, when wishes or intentions lead to actions. 3. The domain of physical phenomena is causally closed (Causal Closure) This is the basic insights of modern science starting with the development of modern physics in the 17 th century. Obviously, the three claims are in conflict. They are logically incompatible! 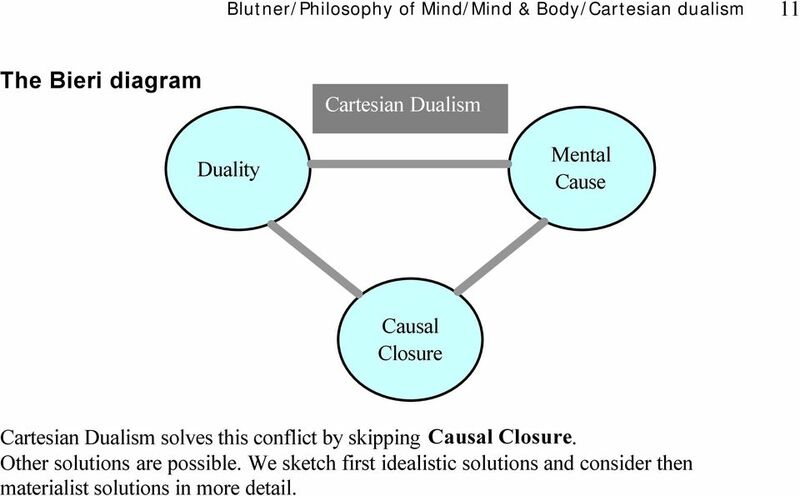 11 Blutner/Philosophy of Mind/Mind & Body/Cartesian dualism 11 The Bieri diagram Cartesian Dualism Duality Mental Cause Causal Closure Cartesian Dualism solves this conflict by skipping Causal Closure. Other solutions are possible. We sketch first idealistic solutions and consider then materialist solutions in more detail. 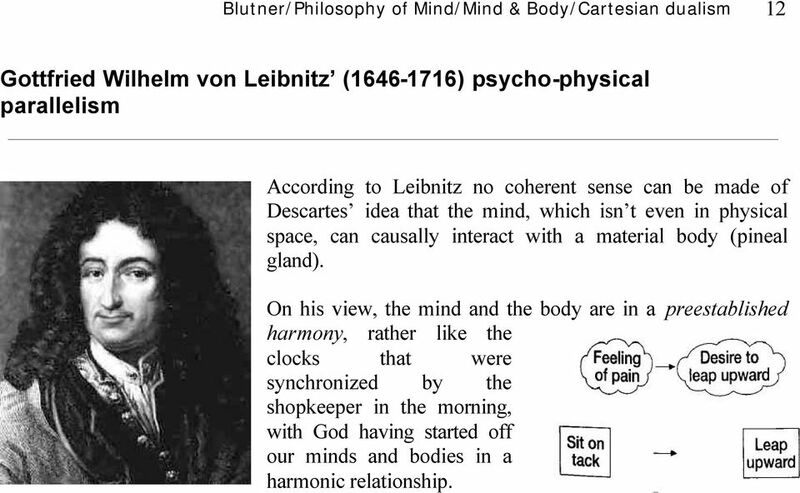 12 Blutner/Philosophy of Mind/Mind & Body/Cartesian dualism 12 Gottfried Wilhelm von Leibnitz ( ) psycho-physical parallelism According to Leibnitz no coherent sense can be made of Descartes idea that the mind, which isn t even in physical space, can causally interact with a material body (pineal gland). On his view, the mind and the body are in a preestablished harmony, rather like the clocks that were synchronized by the shopkeeper in the morning, with God having started off our minds and bodies in a harmonic relationship. 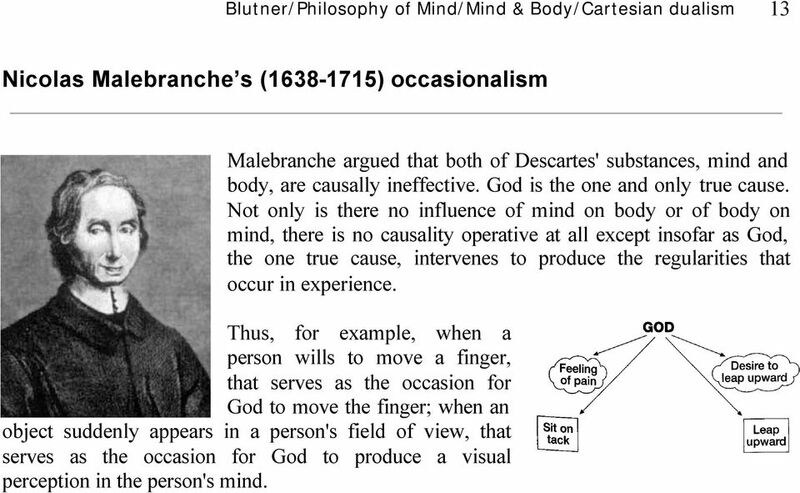 13 Blutner/Philosophy of Mind/Mind & Body/Cartesian dualism 13 Nicolas Malebranche s ( ) occasionalism Malebranche argued that both of Descartes' substances, mind and body, are causally ineffective. God is the one and only true cause. Not only is there no influence of mind on body or of body on mind, there is no causality operative at all except insofar as God, the one true cause, intervenes to produce the regularities that occur in experience. Thus, for example, when a person wills to move a finger, that serves as the occasion for God to move the finger; when an object suddenly appears in a person's field of view, that serves as the occasion for God to produce a visual perception in the person's mind. 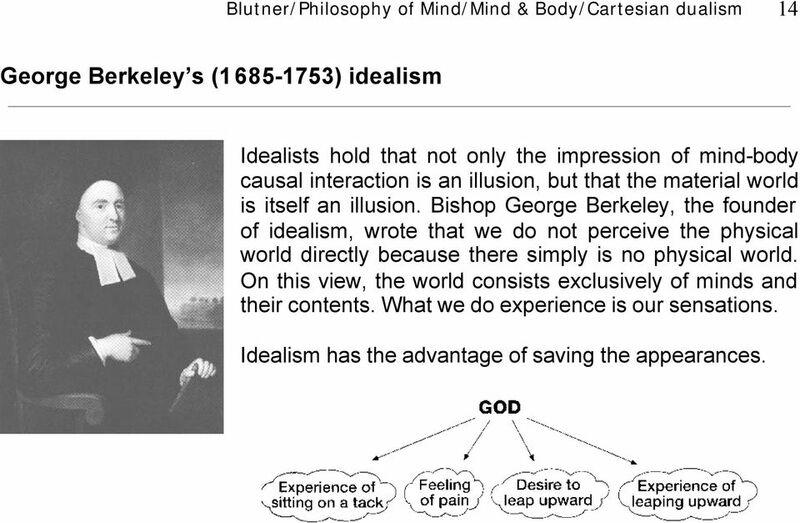 14 Blutner/Philosophy of Mind/Mind & Body/Cartesian dualism 14 George Berkeley s ( ) idealism Idealists hold that not only the impression of mind-body causal interaction is an illusion, but that the material world is itself an illusion. Bishop George Berkeley, the founder of idealism, wrote that we do not perceive the physical world directly because there simply is no physical world. On this view, the world consists exclusively of minds and their contents. What we do experience is our sensations. Idealism has the advantage of saving the appearances. 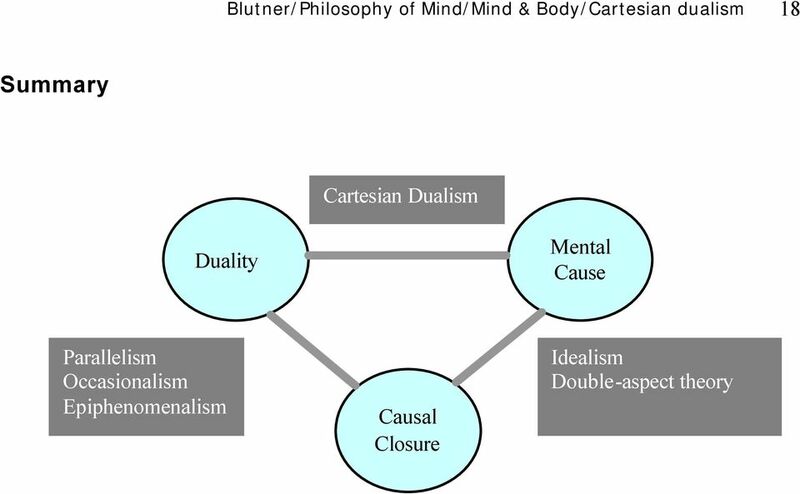 15 Blutner/Philosophy of Mind/Mind & Body/Cartesian dualism 15 Discussion It banishes problems associated with causal interaction between minds and the material world. In some way, idealism has a kind of elegant simplicity of the sort valued in the sciences. But this is simply not enough. Consider the schizophrenic whose mental experiences consist of various hallucinations. A patient such as this may strongly believe that he is, for example, Stalin. Of course, in the reality of those who are not schizophrenic this is absurd. What must be considered is that these are two very different realities, yet both are very real as well. 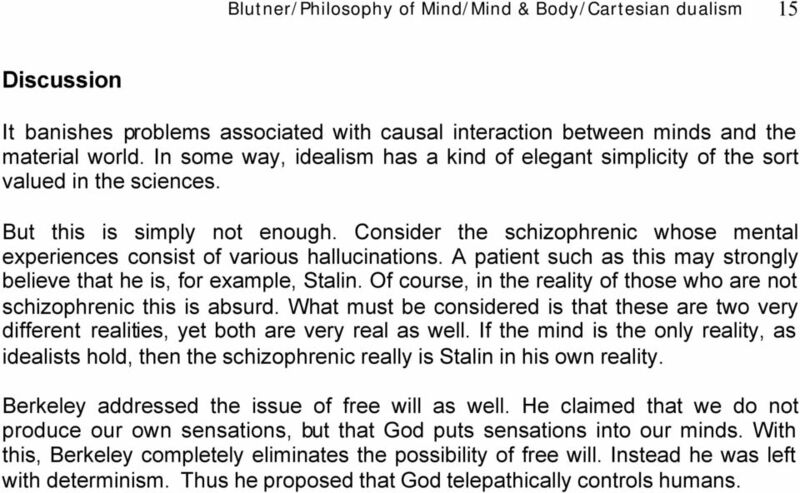 If the mind is the only reality, as idealists hold, then the schizophrenic really is Stalin in his own reality. Berkeley addressed the issue of free will as well. He claimed that we do not produce our own sensations, but that God puts sensations into our minds. With this, Berkeley completely eliminates the possibility of free will. Instead he was left with determinism. Thus he proposed that God telepathically controls humans. 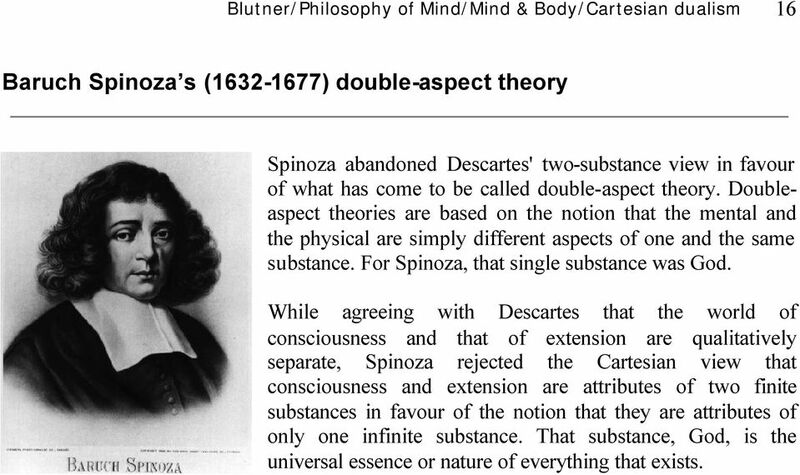 16 Blutner/Philosophy of Mind/Mind & Body/Cartesian dualism 16 Baruch Spinoza s ( ) double-aspect theory Spinoza abandoned Descartes' two-substance view in favour of what has come to be called double-aspect theory. Doubleaspect theories are based on the notion that the mental and the physical are simply different aspects of one and the same substance. For Spinoza, that single substance was God. While agreeing with Descartes that the world of consciousness and that of extension are qualitatively separate, Spinoza rejected the Cartesian view that consciousness and extension are attributes of two finite substances in favour of the notion that they are attributes of only one infinite substance. That substance, God, is the universal essence or nature of everything that exists. 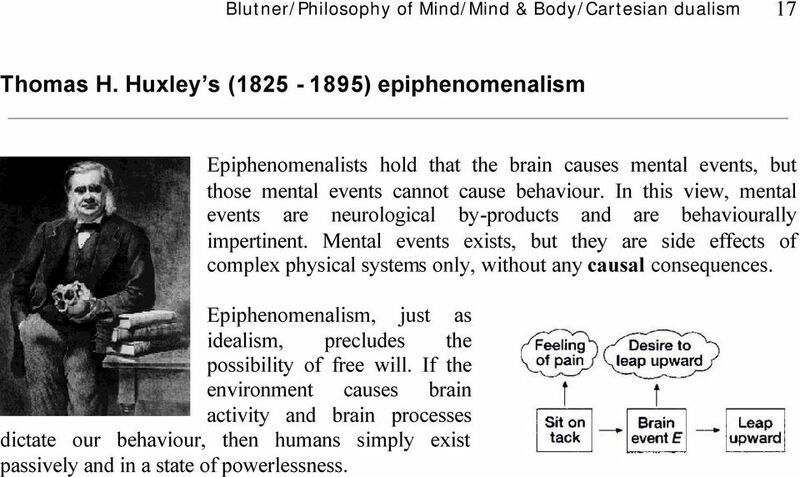 17 Blutner/Philosophy of Mind/Mind & Body/Cartesian dualism 17 Thomas H. Huxley s ( ) epiphenomenalism Epiphenomenalists hold that the brain causes mental events, but those mental events cannot cause behaviour. In this view, mental events are neurological by-products and are behaviourally impertinent. 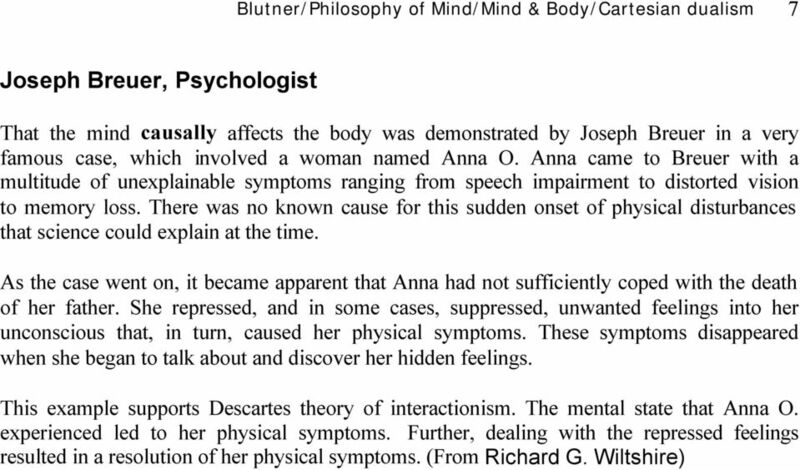 Mental events exists, but they are side effects of complex physical systems only, without any causal consequences. Epiphenomenalism, just as idealism, precludes the possibility of free will. If the environment causes brain activity and brain processes dictate our behaviour, then humans simply exist passively and in a state of powerlessness. What is Psychology? A set of questions about mental functioning trace back to philosophy Aristotle asked about memory, personality, emotions, etc. Analytical Psychology Chapter 3 2 Carl Gustav Jung 1875-1961 Born in Switzerland Kind but weak father, mother was powerful but suffered emotional disturbances Lonely childhood Early illnesses psychosomatic? Contents. Foreword 7. Appendix 1 Coaching questionnaire 101 Appendix 2 PDP document 104 Appendix 3 Overview of competences 106. Arnauld vs. Descartes Theory of Dualism. vs.
1 McMahan, Jeff. The Ethics of Killing: Problems at the Margins of Life. (Oxford University Press, 2002). The Big Picture. Part One: The Nature of Knowledge Weeks 2-3: What is Knowledge? Week 4: What is Justification? Soul, nature and immortality of the How to cite this article: SWINBURNE, RICHARD (1998). Soul, nature and immortality of the. In E. Craig (Ed. ), Routledge Encyclopedia of Philosophy. London: Routledge. Dualism is the belief that the mind is separate from the brain but somehow controls the brain and through it also the rest of the body.